Action from Netherton United's County Cup semi-final defeat to Raunds at the Grange. Photo: David Lowndes. 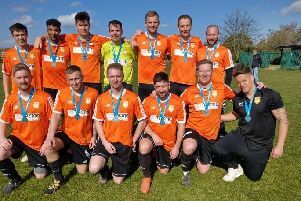 Netherton United suffered penalty shoot-out heartache as their bid for back-to-back Northants Junior Cup Final appearances was scuppered by Raunds Town. The city side fought back to make it 1-1 through Mij Akbar - his first goal of the season - with just two minutes to go against their higher-level visitors to the Grange, but they lost the semi-final 3-2 on spot-kicks. Netherton United skipper Herbie Panting (centre, red) in the thick of the action against Raunds. Photo: David Lowndes. Only skipper Herbie Panting and ice-cool centre-back Ben Daly managed to convert their penalties. Roberto da Silva, Tommy Randall and Dan Fountain all missed. Substitute Lee Clementson struck the crossbar, while Da Silva, Akbar and Adam Scott were all denied by fine saves by the Raunds goalkeeper after the visitors had taken the lead 15 minutes from time. Netherton have a tough PFA Senior Cup quarter-final tie at Peterborough Premier Division title rivals Pinchbeck United this Saturday (February 11). Netherton United's Tom Randall (red) is surrounded by Raunds Town players. Photo: David Lowndes. Moulton Harrox eased into the semi-finals of the President’s Shield with a 4-2 win at Wisbech Town Reserves on Saturday. They will now meet Netherton in the semi-final at the Grange later this month. Dan Woods (2), Marcus Parry and Matthew Watkin scored the Moulton goals. Ketton and Pinchbeck are the other semi-finalists. In the Premier Division Peterborough Sports Reserves maintained their place at the head of affairs with a 6-1 beating of AFC Stanground Sports. Karl Gibbs bagged a hat-trick. The top-flight’s top scorer Ollie Maltby scored twice as second-placed Pinchbeck United beat Thorney 5-0 and Harley Williams also netted twice as ICA Sports won 4-0 at Leverington Sports to stay fifth, but keep an eye on Stamford Lions who roared into sixth place with a 7-1 hammering of Sawtry. That’s five wins in a row for the Lions and 26 goals scored. Jack Travers and Thomas Edwards both scored twice. Jonny Allen claimed a hat-trick as Holbeach United Reserves edged out Deeping Rangers Reserves in a seven-goal thriller. And there was a first win for recently-appointed Crowland Town manager Ian Mcintosh. His side beat Langtoft United 4-2 - it was a first defeat in seven Premier Division matches for Langtoft. Robbie Ellis (2), Matt Barnett and Simkus Virginijus scored the Crowland goals. Netherton United 1 (Akbar) Raunds Town 1. (Raunds won 3-2 on penalties). Crowland Town 4 (Ellis 2, Virginijus, Barnett), Langtoft United 2. Holbeach United Res 4 (Allen 3, Keeble), Deeping Rangers Res 3. Leverington Sports 0, ICA Sports 4 (Williams 2, Pridmore, Smith). Sawtry 1 (Shutt), Stamford Lions 7 (Travers 2, Edwards 2, Ball, Easson, Montgomery). Wisbech Town Res 2 (Hamilton, Lewis), Moulton Harrox 4 (Woods 2, Parry, Watkin).